In 2004, a judgment from the highest court in the UK gave birth to a new era of privacy law. That case, brought by the supermodel Naomi Campbell against Mirror Group Newspapers, is today rightly regarded as a turning point for the protection of individuals’ privacy. The case is seen as the turning point in the development of English privacy law, and has also had major implications for the law elsewhere, including in Australia, New Zealand, Ireland, and Canada. The manner in which the common law’s privacy protections have developed since, and the direction in which they might develop still further, are the subject of this book. 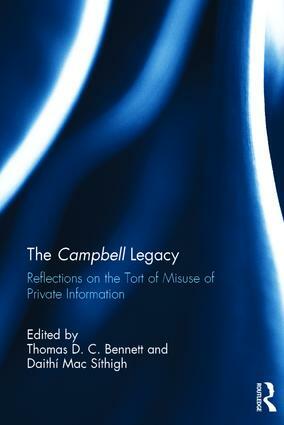 This collection, written by leading scholars in the privacy field from the UK and beyond, considers the legacy of Campbell’s case. The contributors address the Campbell legacy from a range of legal perspectives and discuss broader themes of power, metaphor, consistency, and technological change. This book was originally published as a special issue of the Journal of Media Law. Thomas D.C. Bennett is a Lecturer in Law at Newcastle University, UK. He has written on the development of privacy torts in the UK and across the common law world. Daithí Mac Síthigh is Professor of Law and Innovation at Queen's University Belfast, UK. His research interests are in law and technology.